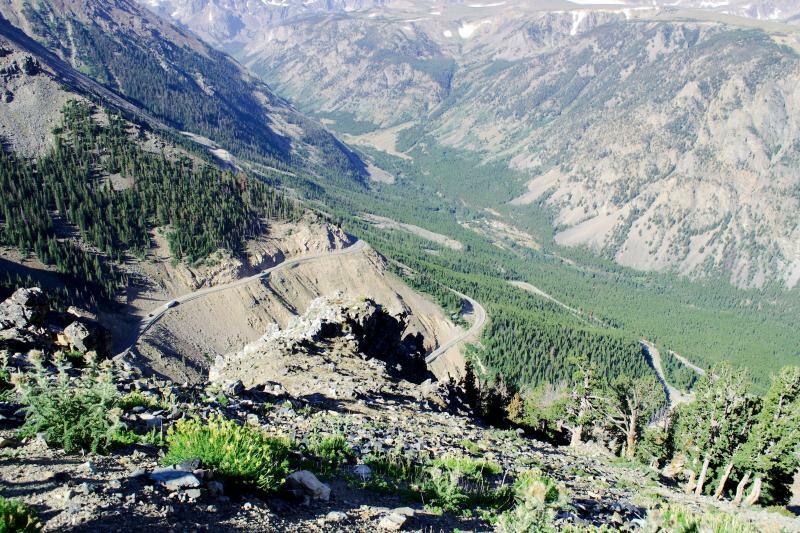 Author Charles Kurault described the Beartooth Scenic Highway as the most beautiful drive in America. In 1989, the highway received national recognition when it was designated a National Scenic Byway. Only 52 other drives in the country share this distinction. This spectacular 65-mile drive reaches the highest drivable points in both Wyoming and Montana. Leaving Red Lodge, U.S. Hwy. 212 climbs 11,000 feet to Beartooth Pass and drops down to the northeast entrance to Yellowstone Park. After mine closings wrecked the economy of Red Lodge, J.C.F. Siegriedt, a Red Lodge physician, lobbied the U.S. Government to rebuild the old Black and White Trail which ran along Rock Creek south of Red Lodge. He and O.H.P. Shelby, the local newspaper publisher persuaded the congress to authorize the Secretary of the Interior to build approach highways to the national parks. Herbert Hoover signed the bill, and construction began in 1931. The highway, at a cost of $2.5 million, opened on June 14, 1936. The 64-mile corridor provides a panoramic view at the 10,942 ft. summit of peaks, varied topography, glaciers, plateaus, alpine lakes, cascading streams, wildﬂowers, and wildlife. The Beartooth Plateau is unique. After endless climbing you come to what appears to be an expansive plains rather than the top of a mountain range. Had you just been dropped here, you would think you were on a vast prairie ﬁlled with deep gorges. Glaciation missed this area leaving it relatively ﬂat and smooth, unlike the jagged sculpted peaks in the distance. There are 25 features here labeled Beartooth all taken from the name of the conspicuous spire the Crow Indians called Na Pet Saythe bears tooth. At its highest points, you can play in snow ﬁelds along the highway. Allow yourself at least three hours to cross the highway. The limitless views demand that you stop every few minutes. The winding switchbacks do not allow speed. Check your ﬁlm supply before heading up. Youll take many photos. And anticipate cool, if not cold weather at the top along with almost constant wind. Take your time and savor this trip, its only open a few short months of the year.